Below are some answers to frequently asked questions about the Access Pass (which replaced the Golden Access Passport in 2007). What is the Access Pass, and who qualifies? 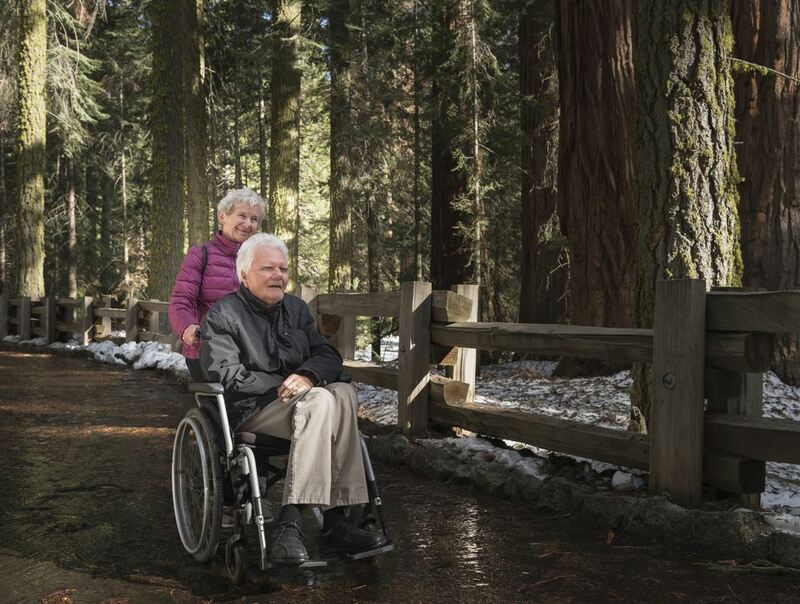 It is a lifetime pass, formerly known as the Golden Access Passport, that provides access to recreation areas managed by five Federal agencies. It also provides the pass owner a discount on some amenity fees such as camping. The Access Pass is free, and it is valid for the lifetime of the pass owner (Golden Access Passports obtained prior to the 2007 name-change also share this lifetime validity). The pass may be issued to U.S. citizens or permanent residents that have been medically determined to have a permanent disability that severely limits one or more major life activities. A permanent disability is a permanent physical, mental, or sensory impairment that substantially limits one or more major life activities, such as caring for oneself, performing manual tasks, walking, seeing, hearing, speaking, breathing, learning, and working. The disability requirements for the Access Pass are not based on a percentage of disability. To qualify for the Pass, the disability must be permanent and limit one or more major life activities. Document issued by a State agency such as a vocational rehabilitation agency. Can a permanently disabled child get an Access Pass? Yes. This allows the caregivers to enter Federal Recreation sites for free when accompanying the child. Why can't an Access Pass be ordered online or through the mail? You must obtain the Pass in person because the official issuing the Access Pass must review the documentation of your disability and verify your residency. What does the Access Pass cover? The Access Pass admits pass owner(s) and passengers in a non-commercial vehicle at per vehicle fee areas. where per-person fees are charged, it admits pass's owner + 3 adults, not to exceed 4 adults. Children under 16 are always admitted free. Note: Photo identification will be requested to verify pass ownership. Where is the Access Pass honored? The Forest Service, the National Park Service, Fish and Wildlife Service, Bureau of Land Management, and Bureau of Reclamation honor the Access Pass at sites where entrance or standard amenity fees are charged. In addition, the Corps of Engineers and Tennessee Valley Authority may honor the Access Pass. Visitors are always encouraged to contact the site they plan to visit and inquire about pass acceptance before visiting. The Access Pass is valid only at participating Federal recreation sites, and not valid at state parks or local city/county recreation sites. Why is the US Army Corps of Engineers accepting Interagency Access Passes but not selling them? The U.S. Army Corps of Engineers (the Corps) was not included in the Federal Lands Recreation Enhancement Act of 2004, which gave agencies the authority to create the new America the Beautiful - the National Parks and Federal Recreational Lands Pass. Although the Corps will not sell or issue the new passes, the Corps will accept the new Interagency Senior and Interagency Access Passes or previously issued Golden Age or Access Passports as proof of eligibility for age- and disability-related discounts. What if an Access Pass is forgotten at home? You can either obtain another Access Pass with proper documentation or pay the applicable Entrance or Standard Amenity fee(s). Will one Access Pass allow a group of people in two vehicles onto a site? No. Only the vehicle with the pass owner is covered. The second vehicle is subject to an entrance fee or must have (or buy) a second pass. Does the Access Pass include any discounts at Federal Recreation sites? At many sites the Access Pass provides the pass owner a discount on expanded amenity fees, such as camping, swimming, boat launching, and guided tours). Inquire at the places you plan to visit. The pass program is managed by five Federal agencies that operate under different regulations and have different fees. Therefore, the discount program for the Access Pass is not handled in the same way on all Federal recreation lands. The best advice is to always inquire locally. Individual Campsites: The discount only applies to the fee for the campsite physically occupied by the pass owner, not to any additional campsite(s) occupied by members of the pass owner's party. Campsites with Utility Hookups: If utility fees are charged separately, there is no discount. The discount may apply if the utility fee is combined (seamless) with the campsite fee. Group Campsites and Facilities (including, but not limited to, group facilities, picnic areas or pavilions): There is no discount for group campsites and other group facilities that charge a flat fee. If the group campsite has a per person fee rate, only the pass owner receives a discount; others using the site pay the full fee. Guided Tours: The pass offers discounts on some guided tours. Only the pass owner receives a discount if one is offered. The Access Pass does not cover discounts in on-site bookstores or gift stores located in Federal Recreation sites. What is the difference between a Standard Amenity Fee, an Expanded Amenity Fee, a Special Use Permit Fee, or a Concessionaire Fee? Since the pass program is managed by five Federal agencies that operate under different regulations and charge different types of fees, it can be confusing to sort out fees, terminology, and to distinguish between a "Federally-managed facility/activity" versus a "concession-managed facility/activity". Your best bet is to inquire locally regarding your fee and pass acceptance related questions.